Identification of maschine readable coding on transparent media. 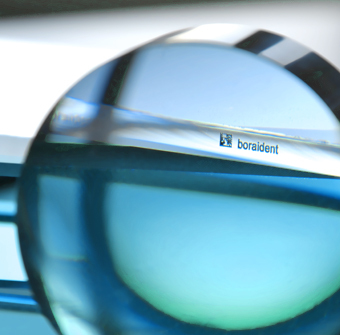 The core competence of boraident lies in changing the optical properties of transparent media through laser-induced processes. Therefore, we develop unique and patented LASER TRANSFER TECHNOLOGIES in oder to set aesthetic, resistant and individual markings with industry codes. Our Laser Marking Systems can be integrated into automated process lines or can be run as stand-alone systems. Resulting from our broad experience we know that the reliable reading of machine codings in automated lines is challenging. For this purpose, we offer a range of adapted reading systems and lighting tools for reading and decoding of industry code markings and customize their integration. The matching of material, marking technology and identification guarantees maximum process stability and reliability in terms of product traceability.